PHD Academy is on a mission to create a unique educational space to train students in cosmetology, massage, and nail technology. They are founded by a multi-generational family of beauty industry professionals with over 20 years experience. PHD Academy has a passion for teaching students how to be successful in their dream job. PHD Academy contacted Satellite Six with the goals of a rebrand, updated recruiting materials, and an online marketing funnel including a conversion-focused website. They needed to reinvent themselves as a midwest company that reflected local student values, not the Salon Professional Academy / 5th Avenue Saks feel that their franchise held them to. 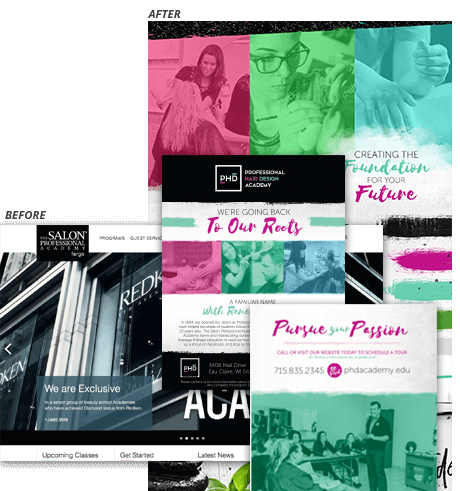 When PHD Academy came to Satellite Six in 2016, they were known as TSPA, and following the branding of the Salon Professional Academy franchise. They saw a new local competitor aggressively target their students, and recognized a need to rebrand their look and messaging to reflect Midwest values, rather than New York values. Working closely with leadership, Satellite Six developed the new PHD Academy brand, and messaging that reflected the passion and career opportunity needs within their prospective student base. This look and messaging was adapted across all the student recruiting and onboarding materials. As the brand came to life, a new site was planned out to maximize results from the two core audiences developed during the brand stages. This included one audience very focused on the experience of the school, and the other who valued actual career potential. 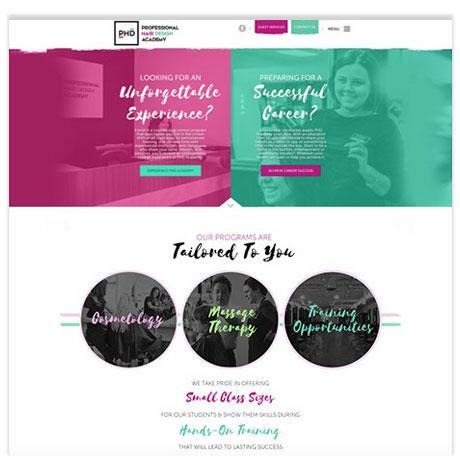 The site created two clear paths for each audience, guiding them through a funnel and into one of several lead capture opportunities, such as a “Your Hairstylist Personality Quiz,” which was a fun way to get prospective students to interact with the site and deliver one of 3 possible personality types that are a perfect fit at PHD Academy. As the core strategy and build phases moved along, the focus shifted into developing inbound opportunities for PHD Academy, including downloadable lead magnets and student value added offers. These highly specialized campaigns were set up using AdWords and Facebook Ads, driving additional lead generation each month.